LOS ANGELES -- Tar from the Santa Barbara oil spill washed up at least as far away as a Los Angeles County beach last month, according to test results released Monday. The findings confirmed what was suspected by many after globs of oil began swamping Southern California beaches in the weeks after a pipeline dumped up to 101,000 gallons of crude oil on the coast May 19. Goo that washed up on beaches east and south of Santa Barbara was sent to labs for "fingerprint" analysis to determine if it came from the Plains All American Pipeline spill or from oil that seeps naturally from the seabed. Tar balls are routinely found on beaches in the area, but the quantity and size - some described as big as patties - forced officials to shut down popular surf and swim posts while they were cleaned up about 100 miles from where the spill entered the ocean at Refugio State Beach. Three tar-ball samples taken in the Manhattan Beach area on May 27 were traced to the spill. Two of the sample results were reported by Plains, and one was reported by the state Department of Fish and Wildlife. While testing continues on samples found as far south as San Clemente Beach in Orange County, it's too early to declare that the spill was responsible for most of the oil and tar that appeared on local beaches, said Alexia Retallack of the Department of Fish and Wildlife. "Is it possible that Refugio oil got to Manhattan Beach?" she said. "We have a tar ball that matches Refugio oil. It answered that question for folks." Four of the samples that Plains had analyzed by scientists at Woods Hole Oceanographic Institution in Massachusetts and the University of California, Santa Barbara were consistent with natural seeps, the company said. Federal regulators are investigating what caused the corroded pipe to rupture and spill oil in a culvert that drained up to 21,000 gallons into the ocean at the popular beach campground that remains closed into July. Local, state and federal prosecutors are also investigating. Nearly 200 birds and more than 100 marine mammals, mostly sea lions, have been found dead in the wake of the spill. "This finding shows how unpredictable and widespread oil-spill damage can be," said Kristen Monsell with the Center for Biological Diversity. 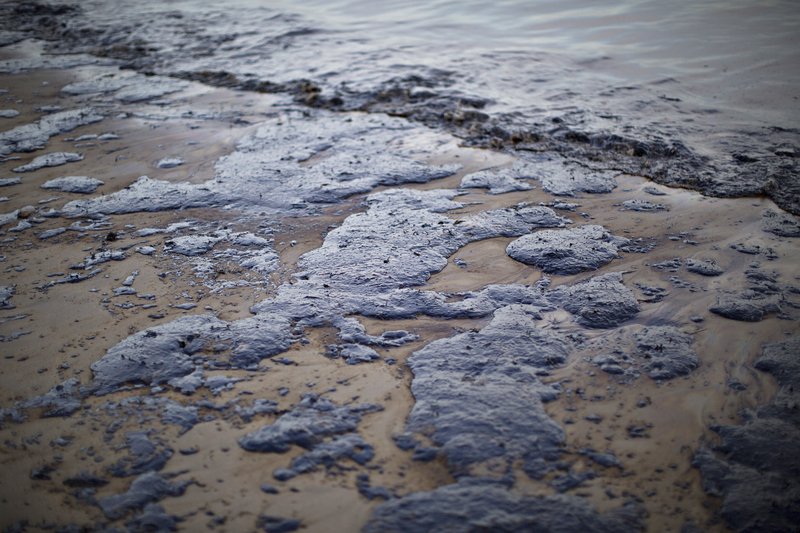 Houston-based Plains has apologized for the spill and is paying for the Santa Barbara portion of the cleanup, which has surpassed $65 million. A company spokeswoman said no determination has been made about whether the company will have to pay for the cleanup near Manhattan Beach. Rep. Ted Lieu, D-Los Angeles, said he expects Plains will be held responsible for the Los Angeles-area cleanup costs and penalties.